Yaffa Yarkoni, one of Israel's greatest and best-loved singers, passed away Sunday in Tel Aviv at the age of 86, following a battle with Alzheimer's disease. Lyricist Avi Koren, a close friend of the singer's for 45 years, recalled yesterday that Yarkoni, an Israel Prize laureate, once said to him: "Look how I am fooling the entire world - after all, I have no voice." "She may not have had a voice, but she was the voice of the country. My mother listened to Yaffa Yarkoni; my grandson listens to Yaffa Yarkoni; and she accompanied us, the members of my generation, all our lives," Koren said yesterday. "At the age of four, we sang her children's songs; as teenagers, we danced to the sounds of her ballroom tunes. During the Six-Day War, she came to perform at outposts at which our friends fought. She was there all the time." Yaffa Yarkoni sings "Davar Lo Od" ("Nothing More") in this clip from Gil Shani. 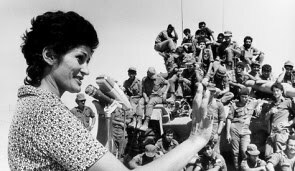 Yaffa Yarkoni was known as the singer of the wars, a tradition that began during her own IDF service in the War of Independence. She was known as the singer of the wars, a sobriquet that she detested, but when Yaffa Yarkoni, Israel’s queen of song who delighted generations of children, soldiers and all audiences died on Sunday only a week after her 86th birthday, she was remembered more for fading out of the limelight.